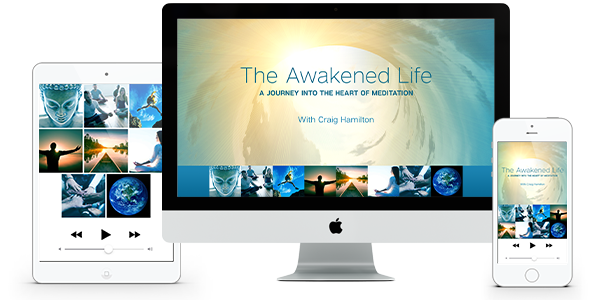 In this 2-hour Meditation Workshop, Craig illuminates the extraordinary possibility of genuine spiritual awakening and demonstrates how the meditation practice of Direct Awakening opens the door to awakened consciousness. He then leads us through a series of four different meditation practices so that you can begin to discover the mystery of awakening in your own immediate experience. To listen to the audio on your computer or mobile device, simply click on the arrow below or download by clicking on the purple download button. In our first weekly 30-minute guided meditation, Craig leads us deeper into the first practice he introduced in this month’s meditation workshop. After a brief exercise to cultivate a powerful intention, you’ll be guided into one of the core practices of Direct Awakening—the practice of Allowing. By letting go of any need to change anything about your experience, you will awaken to the inherent freedom of simply being as you are. When we step onto a path of awakening, we find ourselves called to leap beyond everything we have ever known and embrace a mystery our mind will never be able to comprehend. In this guided meditation, we practice letting go of our attachment to knowing and relaxing into the essential mystery at the heart of reality itself. By giving up any investment in the mind’s power to know, we can discover the primordial innocence of our own true nature, which paradoxically opens the door to an infinite source of wisdom. In every moment of our waking life, we are aware. We are conscious. Yet, because of our habitual focus on the “content” of awareness — the thoughts, feelings and sensations that arise from moment to moment — most of us live our entire lives without ever becoming aware of awareness itself. At the heart of spiritual awakening is the unexpected and always arresting recognition of awareness itself, prior to everything. When we learn how to shift our attention from its habitual fixation on “objects” to the limitless awareness in which all objects arise, we discover that we have always already been free. We come home to the Source. This meditation will guide you through a process designed to reveal Awareness to itself. By becoming aware of awareness and learning how to rest in the natural recognition of awareness itself, you will come face to face with mystery of who you are prior to being aware of anything.